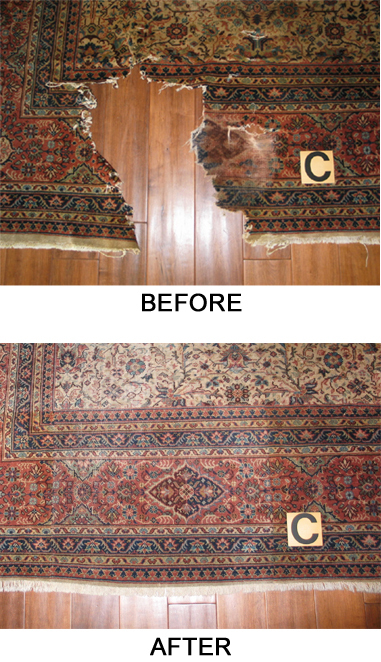 Persian rug repair needs for our South Bay customers are served by the award winning rug repair workshop at Antique Rug Company. 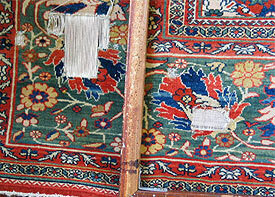 Clients may call and bring rugs for inspection and advice or to schedule a pick up. The workshop serves all of South Bay cities and surroundings. All handmade rugs are works of art. 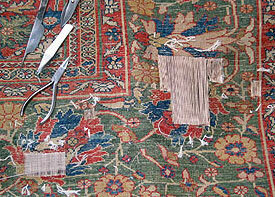 Rugs, whether antique, collectible, family heirloom or new, ought to be cared for and maintained as they are used. We recommend following the maintenance suggestions outlined at RUG CARE section to keep your rugs in their best condition for years to come. But if an accident causes damage to a rug, it is best to seek repair advice promptly and to avoid risk of additional losses. 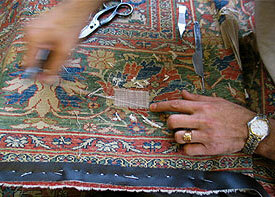 Our knowledgeable rug weavers will inspect your rug and discuss with you the best options for repair or restoration. There is no repair project too small or too extensive for the workshop. And over the years we have repaired many types of handmade and machine made rugs — Oriental, Persian, Navajo, mechanical and other. At the end of this page a link will take you to Before and After sampling of images for completed repairs.